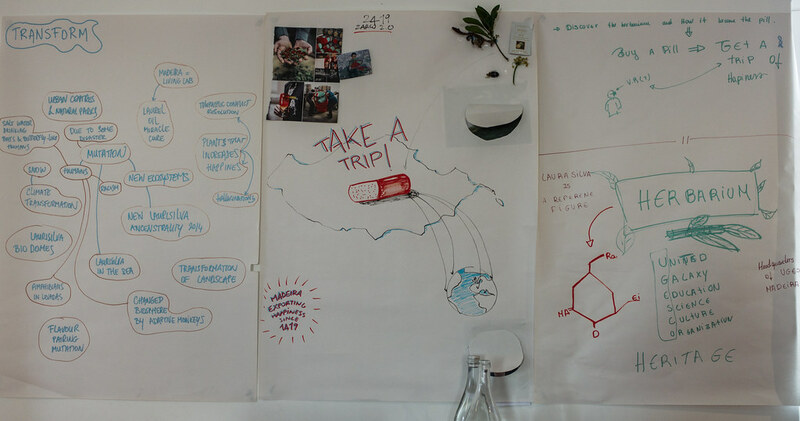 Notes from the Laurisilva Futures workshop held in Ponta Do Sol, on the 7th of November 2014, organised by M-ITI, hosted by FoAM. In the context of Future Fabulators M-ITI conceived and designed a locally inspired context-aware transmedia story. Drawing inspiration from a creative writing workshop and future scenario session, they developed a fictional story around two central themes: the past-present-future impact of human settlement on a particular ecosystem, in this case the centuries-old ‘living lab’ and UNESCO-protected wilderness of Madeira; and the healing properties of local flora as explored in folk remedies. 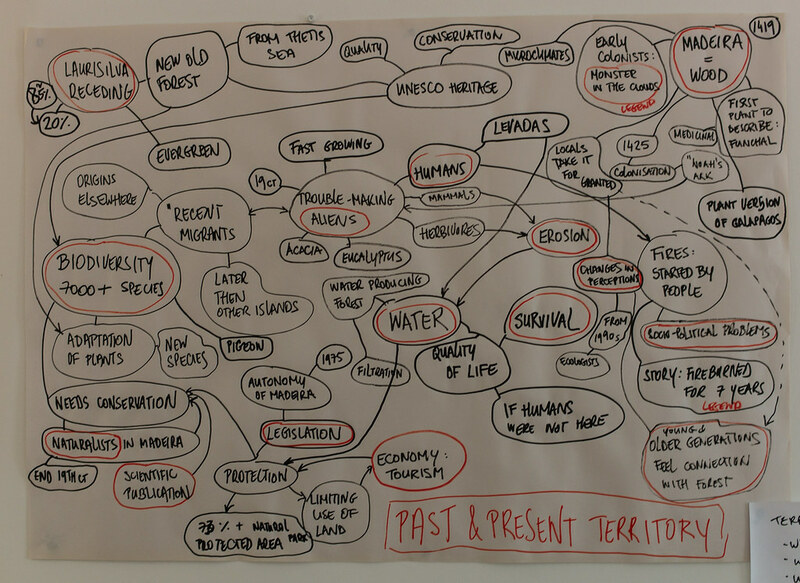 Laurisilva Futures workshop invited its participants to imagine future scenarios for the Laurel forest and its entanglement with humans. 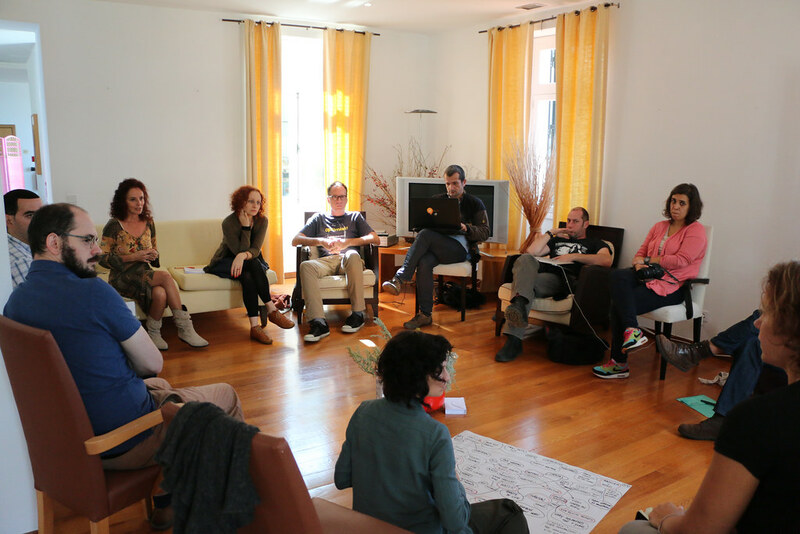 Participants: Valentina Nisi, Mara Dionisio, Julian Hanna, Giovanni Innella, Susana Fontinha, Dina Henriques, Mauricio Reis, Tina Auer, Tim Boykett, Alex Davies, Istvan Szakats, Rarita Zbranca. 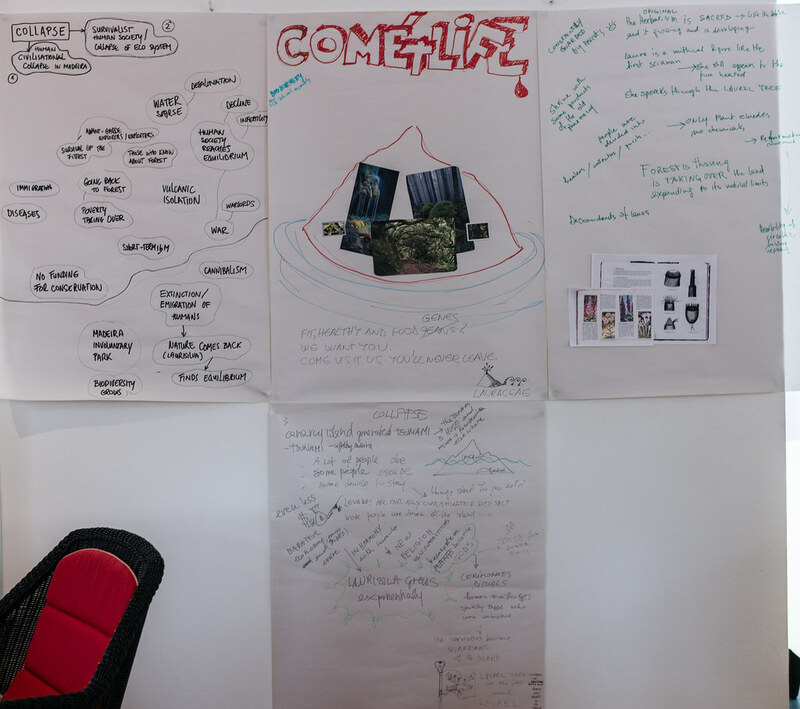 In November 2014 M-ITI organised a two-day workshop where all the Fabulators came together with experts in biology and design in order to understand and imagine the past, present, and future of the laurisilva forest, especially in the context of the transmedia story in the making. On the morning of the first day an experience prototype of the story was deployed and experienced by the whole group. Twelve people walked through the village of Ponta do Sol encountering characters, settings, plants, and natural remedies that are part of the life of our heroine Laura and that led to the creation of Laura’s fabled herbarium. In the afternoon a group of researchers and experts (including biologists and ethnobotanists) took the group on an educational walk in the heart of the Madeiran laurisilva, describing the plants, climates, and remedies that form such a wealth of heritage on the island. On the second day of the workshop, FoAM led a future scenario session. More about the outcomes of the workshop see below. To design the scenarios we uset the technique called four generic futures, as described by Jim Dator, Director of the Hawaii Research Center for Futures Studies, University of Hawaii at Manoa. These four alternative futures are: ‘grow’, ‘collapse’, ‘discipline’, and ‘transform’. The ‘grow’ scenario imagines a future in which society continues to grow and develop according to its present trajectory. The ‘collapse’ scenario, meanwhile, has been gaining popularity in recent years as more and more people worry about the unsustainable state of the environment, the economy, and so on. In order to avoid ‘collapse’ many people favour a ‘disciplined’ vision of the future, in which people’s lives are governed by a set of values (e.g. natural, spiritual, or cultural) rather than by endless economic growth. The fourth alternative is ‘transformation’, in which for example many technologies converge rapidly to transform society from its present state into a new post-human world. The one thing that people still do better than machines in this radically transformed future is to be creative. 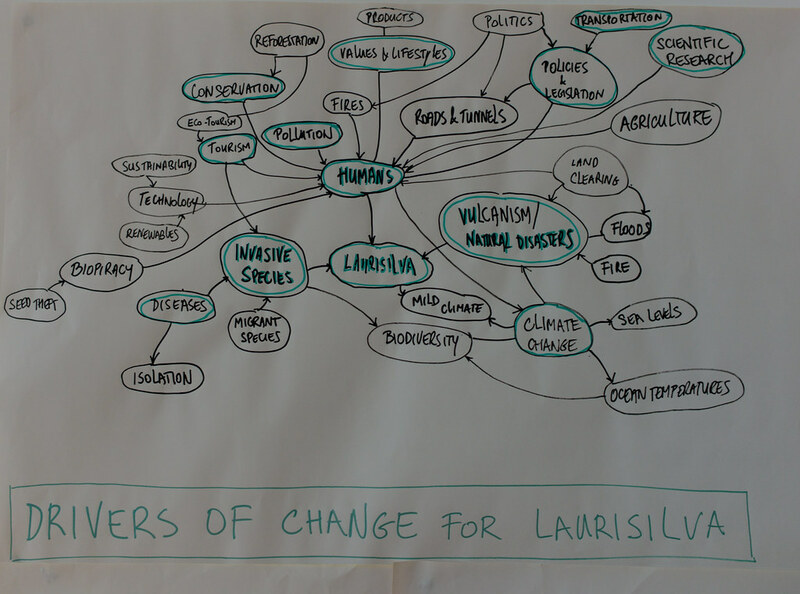 After discussing and highlighting the major drivers of change with regard to the future of the laurisilva forest, we discussed these drivers in relation to three of the four futures mentioned above (we developed the grow scenario as a skeleton, but did not continue incasting, as it didn't resonate with any of the participants). 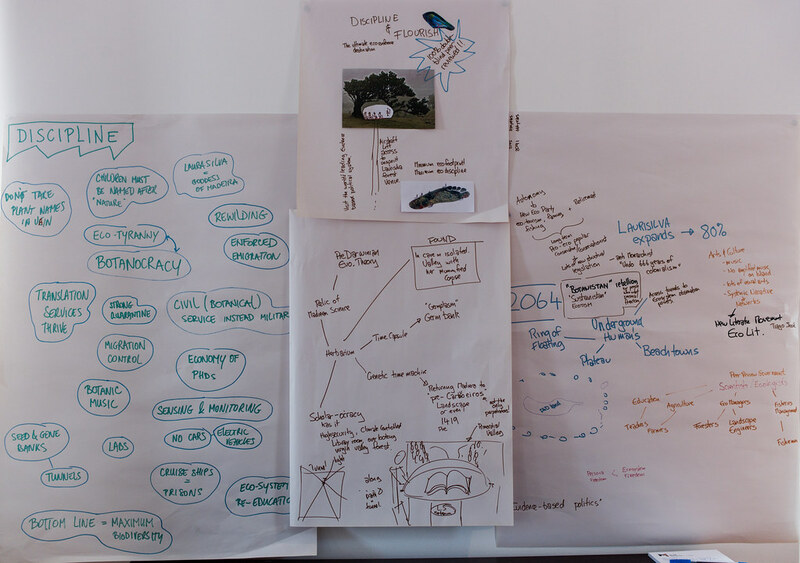 We explored possible scenarios that could develop from mentioned drivers and what the future might be like for M-ITI's fictional character Laura and her herbarium in each of these three alternative futures.